Alan Gilbert launches an appeal to the Whitney Biennial curators, lamenting the overlooked Secretary of State Donald Rumsfeld for his prodigious obfuscating oratory. Critique, critique, critic. 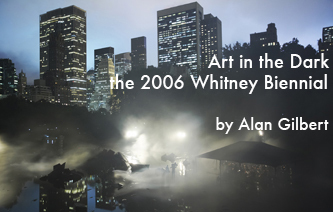 Gilbert reminisces on the 2006 Whitney Biennial. Cheers.